First Line: I am writing this at the behest of my advocate, Mr Andrew Sinclair, who since my incarceration here in Inverness has treated me with a degree of civility I in no way deserve. Three people have been brutally murdered in a remote farming community in the Highlands of Scotland in 1869. Seventeen-year-old Roderick Macrae has been arrested, and there is no question that he did commit the murders. But why would such a shy, intelligent boy do something so terrible? And... will he hang? 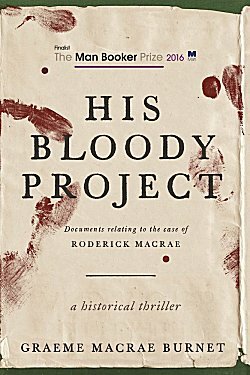 His Bloody Project is presented as a collection of documents discovered by the author, Graeme Macrae Burnet. Readers begin with statements from the police and the villagers of Culdie in Ross-shire. Impressions of the boy vary wildly, but chief among the papers is Roderick Macrae's own memoirs where he tells readers the series of events that led him to murder. Medical reports, psychological evaluations, and courtroom transcripts from the trial follow. It's oh-so-easy to forget that you're reading fiction instead of true crime. Beautifully delineated are the lives of the crofters (farmers) who must contend daily with the whims of the landowners, factors, and constables. And young Roddy's life is heartbreaking. His life definitely held a great deal of promise, but it was ruined by poverty and the maliciousness of others. His Bloody Project unfolds to its inexorable conclusion, allowing readers to absorb the hopelessness of Roderick's life. Nothing is spelled out; readers are allowed to think for themselves every step of the way... and to wonder if the trial's outcome may have been different if events involving Roderick's sister had been allowed to come to light. This certainly isn't cheery reading, but it's a masterful bit of storytelling. Oh, this one sounds like a terrific mix of the historical era and the mystery itself, Cathy. And the setting is great, too. May have to put this one officially on the radar! I hope you do. If I remember correctly, it was on the list for the Man Booker Prize. Read it, was fascinated by the brutal lives of the crofters, their oppression and poverty. That I thought was extremely compelling, more in a certain way than the murders and the motive. However, some moral dilemmas. While I sympathized about the murder of the adult because he was a horrible person, the murders of the children upset me a lot. This is fiction I told myself, but still. I kept saying, "Why? Why? Why? What was the point?" Unless there was psychopathology there or so much human misery that the anger just exploded. Still a mystery to me. I think his pent-up rage and frustration had reached a saturation point, and he just exploded. He would've at least attempted to kill everyone in the room regardless of whom they were. That he couldn't control himself and killed children shows how badly he was damaged. Yes. I felt like a psychologist had to analyze this book's resolution, but you're doing a good job. It's like these people who go to an ex-spouse's workplace and start shooting people, whoever is there. I do feel genuine sympathy for the crofters who were very oppressed and poverty-stricken and whose daily lives must have been so difficult to get through. And don't forget the Highland Clearances, when landowners would throw crofters and their families out of their homes with no warning.